By virtue of their 2-1 win over Leicester City at Turf Moor yesterday, Burnley have now opened up a nine point gap on their vanquished opponents and have more or less secured seventh place in what has become a season to dwell long in the memory of all Clarets fans. According to my calculations, there are only three contingencies which could now prevent Burnley’s participation in next season’s Europa League: a complete and utter collapse in form, Southampton winning the FA Cup or the outbreak of a massive global conflict. I will leave it to you dear reader, to decide which of these is most likely. Yesterday’s game was far from a straightforward three points; it was hard earned against a Leicester team who are of a very similar standard to Burnley and who threw their all into their attempts to find a route back into the game after falling behind to two early goals from Chris Wood and Kevin Long. 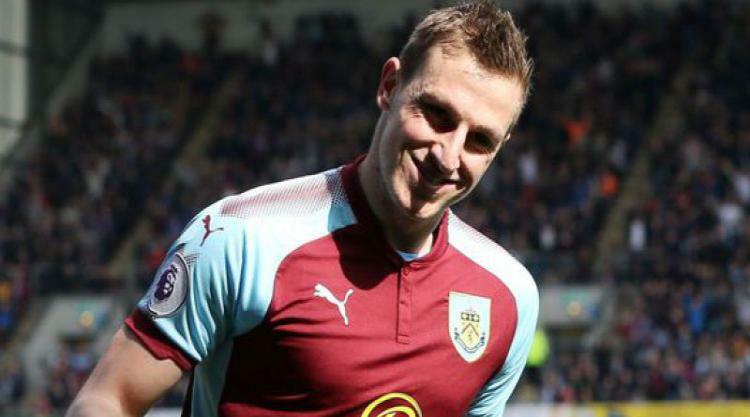 Burnley's Chris Wood seems to have redefined the skill of the one-two off the goalkeeper. As with his goal against West Bromwich Albion, he seized on a rebound off Foxes' goalkeeper Kasper Schmeichel and drilled his shot into the bottom corner of the net. The Claret’s opener was mainly about a “Kevin DeBruyne-esque” reverse pass from Ashley Barnes which created the opening for Wood and which would not have looked out of place on a Manchester City or Barcelona highlights video. Burnley’s second was a more routine affair, Kevin Long charging in and leaping to apply his forehead to Johann Berg Gudmundsen’s swinging far-post corner. Aside from the actual goal, it was an additional delight that Long’s years of faithful and often unacknowledged service to the club be rewarded by this moment in the spotlight. The spotlight was where Nick Pope was thrust when Tom Heaton injured his shoulder early in the season. Since then Pope has performed to a level way beyond that which could have been reasonably expected. If there was any lingering scintilla of doubt in Gareth Southgate’s mind that Pope has been consistently the best of the goalkeepers at his disposal for the World Cup, then his assured display at repelling the waves of Leicester pressure yesterday must surely have banished them. The saves he made from Mahrez and Vardy were discharged in his usual unfussy manner, but were in fact very difficult and not for the first time Nick Pope was instrumental in preserving Burnley’s lead. He was eventually undone by a typical Vardy goal, in which the England striker peeled away from James Tarkowski and shot past Pope from an angle. It was a well taken goal, and probably a proportionate reward for Leicester’s efforts. But the victory and the points belonged to Burnley, their fifth in succession and an emphatic response to those who thought that Burnley’s season would fade into mid-table obscurity in those dark winter days when the Clarets went eleven games without a win. Burnley need to win only two of their remaining five games to make seventh place a mathematical certainty. The Passport Office in Liverpool had better prepare themselves for a huge spike in applications from the Burnley area. This article was written by uber Burnley fan Dave Thornley who contributes regularly on behalf of Clarets Mad (TEC).